In the budget category, it is a rare occurrence to find a TV that performs well on all fronts. 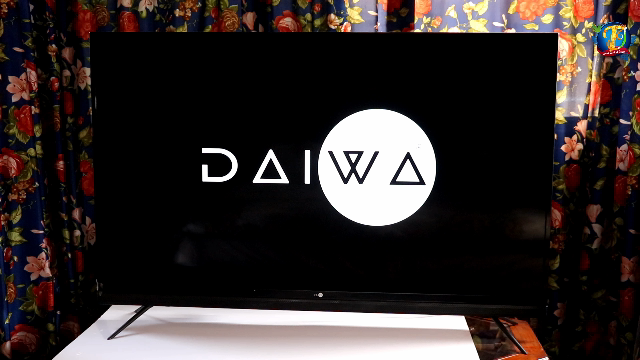 In the process of finding an ideal 55 inches in the budget category, I stumbled upon Daiwa's latest offering, TVs that come with their innovative Quantum Luminit technology. The TV sent to me was Daiwa 55 inches 4k Android TV. I and my staff were really amazed to see a budget category TV performing this brilliantly. The picture quality of this TVis unbelievingly far superior to all TVs in its category. Here I like to mention that the Quantum Luminit models of Shinco & Daiwa are exactly the same, just stickers and logo have been exchanged. Shinco is cheaper as it is available online, while Daiwa is a bit costlier as it is also sold in the open market and the company needs to adjust the retailer's commission too. This 55 inches TV comes with a built-in sound bar and is available in 43 & 49 inches too. It is just that the 43-inch TV does not come with a built-in sound-bar & has 400 Nits brightness. In the carton along with the TV, you get a two-piece tabletop stand, a manual guide, warranty card, wall mount, an air remote, a pair of batteries & one Sensy STB controller through which you can integrate the set-top box channels with your TV's UI and operate it with the single remote. This TV comes in a sleek & stylish design. Its bezel is ultra-slim from three sides. A sound-bar has been fused into the lower side bezel. The grill design of this sound-bar enhances the overall look of this TV to impart it a tall boy appearance. The built quality of this TV is pretty good, it does not appear a budget TV from any angle. You get 3 HDMI ports & 2 USB ports in it, out of which 1 is USB 3.0. Two HDMI ports have HDCP version 2.0, while one comes with HDCP version 2.2. It has an Ethernet port, optical digital port, headphone jack, antenna port, SD card slot, along with inbuilt Wi-Fi. This TV comes with an Air remote at the back of which you will find a QWERTY keypad. Though mostly, all TV remotes come from China, the quality of this remote is decent and I did not face any difficulty in using it. Now, let's switch on this TV. This TV greets us with a Daiwa logo. And, in comparison to other Android TVs, this one boots up fast. On switching on, this TV greets you with this UI. You get many applications preloaded, which you just need to download and install. We will talk about the Android part later on, in this article. The panel of this TV is A+ grade VA that comes with DLED backlighting. The dynamic contrast ratio is 6000000:1 & brightness of this TV is 450 Nits. Its response time is 8 ms. This TV has built-in HDR-X with the 4k enhancer. Dedicated on/off buttons for them have been provided in the settings. Apart from this TV, the 4k enhancer is found only in Sony & Samsung TVs. According to the company, HDR-X enhances each & every pixel to render enhanced colour, brightness & contrast, thereby, increasing the detailing clarity of the TV. This TV supports HDR 10. The picture details in this TV gets displayed with amazing clarity. Dark & bright parts both have much clarity in details. This time, the company has employed Quantum Luminit Technology in its TVs, which is their own premium image processing technology in which superior class LEDs with high Wide Color Gamut and special 2 piece DBF film sheet is used to enhance colour, brightness & contrast to render images only next to a QLED TV. In this TV, Wide Colour Gamut that has been fused with Quantum Luminit. The company claims that its TVs have more than billion colours alike Samsung QLED TVs. If I would not have seen this TV with my own eyes I would have hardly believed that a budget TV can display this great picture performance. Whatever technology the company has employed is definitely successful in enhancing the colours of this TV along with its brightness & contrast. The colours of this TV are as deep as any QLED TV and the brightness, contrast, picture sharpness all is pretty good. The colour encoding system of this TV rests at NTSC 95%. The VA panel plays a major role in making the blacks much deeper. Against a dark background, you can see colours pop out on this TV. There are 5 picture modes, Standard, Dynamic, Vivid, Soft, User & Eyesafe mode. Eyesafe mode reduces strain on eyes. The refresh rate of this TV is 60 Hz, but, in normal TV usage, we were unable to observe any motion blur it. The viewing angles of this TV are decent considering that it has a VA panel. The picture upscaling capability is pretty effective. Low-resolution videos get upscaled on this TV to a much better resolution. HD channels playing with such clarity is a rare occurrence in 4k TVs. Not only HD channels, but SD channels, too, look good on this TV. For sound, this TV is graced with a fused-in sound-bar that has 2 speakers giving 20 Watts power output. It has Dolby Digital & Surround Sound. Its speakers have tweeters too. The audio is very loud with deep bass deep & there is a clarity in dialogue delivery. This is an Android TV that has Nougat Operating System. It comes with 800 Mhz Dual Core Cortex A73 Processor. The graphics Processor is dual core Mali 450 clocked at 540 Mhz. It comes with 1 GB RAM & 8 GB ROM. Though these specifications are quite low, I did not face difficulty in playing any of the applications, neither did this TV hang, even once during the testing that continued 3 days long. 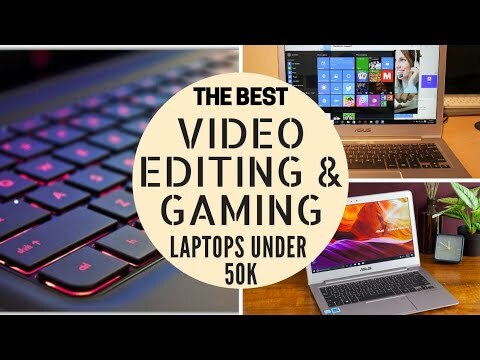 For watching serials or videos, these specifications are okay, but for gaming, you will definitely need a gaming console like PS4. You can play YouTube videos in 4k resolution too, but for that, you will need high Internet speed. Jio sim can play videos only up to 1080p, after that it starts buffering. On this TV, you get the playability of almost all favourite applications that Indians watch. Applications like Hotstar, Amazon Prime, SonyLiv, Netflix, ALTBalaji & YouTube come preloaded. You can even sideload applications on it. Jio TV & Jio Cinema was successfully sideloaded on it. You will find a lot many games and applications in their Play store too. 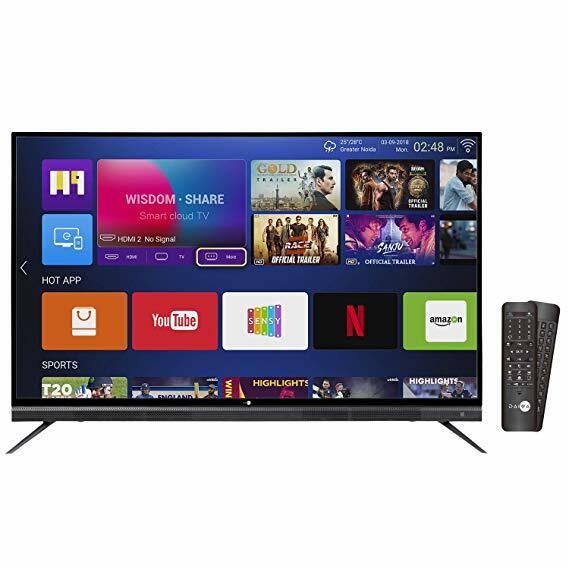 One of the best things about this TV is that you don't need any external Android TV box with it and almost all applications play smoothly on it through Jio Sim also. 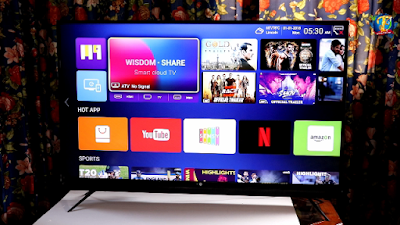 I have faced difficulty while playing some or the other app, in almost all TVs and Android TV boxes, but all my favourite applications played smoothly on this TV. I want to highlight here, that Mi TV does not support Netflix, Jio TV, Amazon Prime & YouTube in 4k resolution. Blaupunkt also does not support YouTube in 4k. The UI of this TV is pretty good that gives a smooth experience while navigating. It has a content bar and it starts to give you suggestions according to the programmes that you watch regularly. While browsing contents too, you can watch TV in a small window. The most attractive feature of this TV is the set-top box controller that you get along with this TV. You need to plug this controller in the USB port of your TV and keep the sensor in front of your set top box. After that, you will be able to access the channels of your set-top box through the remote of this TV. The channels automatically get integrated into the UI of this TV and allow you an access to the thumbnail preview of each channel. You can easily see the programme being telecast on each channel. This TV comes with Miracast, Airplay & E-share features. Through E-share, you can wirelessly enjoy the music stored on your smartphone on the good audio output of this TV's soundbar. Along with this, you can also play the videos stored on your smartphone on the big screen of this TV. Pictures & videos both get smoothly cast on this TV. However, this TV might not support the audio of some smartphones, then you get to hear the audio of the videos on your smartphone only. This TV provides you HTML 5 browser support. Before switching over to its cons, I would like to emphasize that whatever features are there in this TV all function very well. Bluetooth support & voice command remote are the only features that go missing on this TV. However, you can buy a Bluetooth Transmitter to fill up this lacuna. In my opinion, the company also misses out on one more USB port as one port remains preoccupied with the dongle of the remote. However, a USB splitter can solve this problem too. In the budget category, this TV is par excellence! The company has 105 service centres across India. Before placing order talk to the company to get assurance regarding services in your city. These TVs are available on Amazon as well as PayTM Mall. But, I am not in favour of purchasing TVs from PayTM Mall as many complaints have come to me regarding duplicate & refurbished products being sold over there. The customer care cell of PayTM Mall is seller-oriented rather than being customer-friendly. Sellers prefer PayTM Mall as over there, there is no pressure on them to maintain quality, nor, they have any fear of getting banned in case there are multiple complaints against them. The TVs that you return due to defects are duly repaired, beautifully re-packed and sold off through these channels. Though they function well, their life decreases as they are used products. You can also download My Shinco App in your mobile to contact the company regarding your TV queries! You can purchase the extended warranty from the dedicated app only. Note: extended warranty scheme will be applicable, when the user purchases the extended warranty within 30 days from the date of purchase of the product. The details of Shinco tv has been brought to the knowledge of general/layman interested buyers of this tv very nicely. I want to buy this tv but I am afraid that the name of my city i.e Chandigarh has not been reflected in the list of Service centres. So, what should I do in this situation? Please help. When is 65 inch shinco going to launch? I am intend to buy shinco 55 inch tv.But by going through details its came to my knowledge that its picture upscaling is only working in through HDMI port only.By plugin and play through USB port the picture quality is not up to the mark bcz of this picture upscaling absence.Is it possible to see high quality videos through USB port...? "The Indian Observer is an online Media portal that encompasses Articles from various walks of life. Our objective is to be impactful with key relevant messages reaching our readers in an unbiased manner in order to foster a bond of trust with them. Our values are deep rooted in the guiding principles, Fairness, Truth and Justice. We believe in the Freedom of Expressions, but also know where to draw the line. We follow a secular policy that believes in fair criticism and comments. Our aim is to promote and uphold harmony and unity amongst the people of India". Edge-Lit LCDs VS Direct-lit LCDs | ELED TV VS DLED TV : Which is better? | LCD Vs LED?